Congratulations to Donna Sessa and her colleagues from the Quogue Historical Society for their tenacious effort to preserve the Deacon Thomas Cooper House in Quogue. 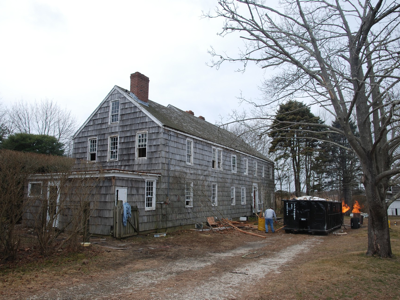 I know this morning’s photo (above) does not capture the house in all its former glory, but the simple fact that it remains standing today is a major accomplishment and tribute to the Quogue Historical Society and their negotiations with owner/developer Joe Gazza to develop a collaborative effort to yield results that preservationists everyone will appreciate. The story is about to be told in the Southampton Press next week so I don’t want to steal anyone’s thunder by revealing the details of this collaborative effort. But I would like to offer some insight into the significance of this historic structure. 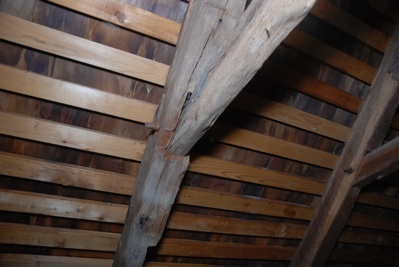 For example, the attic remains relatively intact with the timber frame structure very much unchanged, as shown in the following photo of the original collar ties mortised into the roof rafters and secured with “tree nails” or trunnels, wooden pegs or dowels used to fasten pieces of wood together in early timber frame construction. 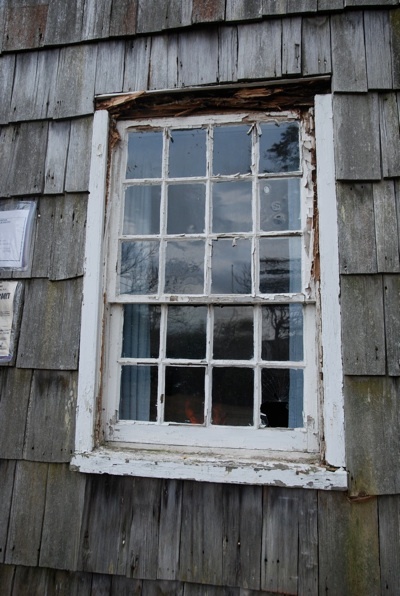 The original windows have 12/8 divided light sashes and, although they are currently not in great condition, they possess much of the original glazing. These historic windows are among the most important elements of this building.